The current paper looks into the activities of Queer people in promoting their right to the city in Brasília, Brazil. 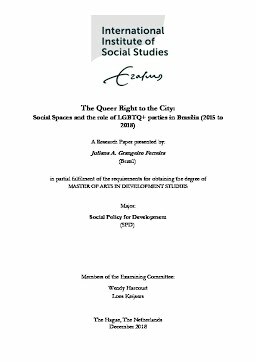 Through this work, I investigate how Lesbians, Gays, Bisexuals, Transgenders, Queer and others non-conforming sexualities and genders (LGBTQ+) are transgressing hetero-sexist laws and urban planning in a highly regulated context: the city of Brasília. To explore those meanings, I use theories of Queer Geography, Urban Planning and the Right to the City. Additional concepts such as gender performativity, precarity and homonormativity are used to capture the nuances more accurately. The research is also done based on a standpoint epistemology. Through theories, concepts lived experiences and subjectivities I show how marginal lives are slowly gaining ground by building new queer-diverse spaces in Brasília. I point out how not all experiences are the same, as women and people from lower classes face greater challenges. Finally, I show how their work in these spaces (and lives) are constantly challenged and threatened at different levels, which may well increase given Brazil’s current political scenario.